The crossing manager allows users to define the cross settings, choose parents, review seed inventory, reserve seed, and make crossing lists.. Defining the crossing settings can be done every time a cross is made. However, most breeding programs only use a few crossing methods. The BMS allows you to save commonly used methods and create a list of favorite methods. You are also able to set a default method. Select parents from established lists by dragging and dropping to the appropriate female and male parental lists. Save the parental lists to activate the save button on the crossing list. Review the seed inventory of the parental lists by selecting Inventory View from the Actions menu. Reserve parental seed by selecting Reserve Inventory from the Actions menu in Inventory View. 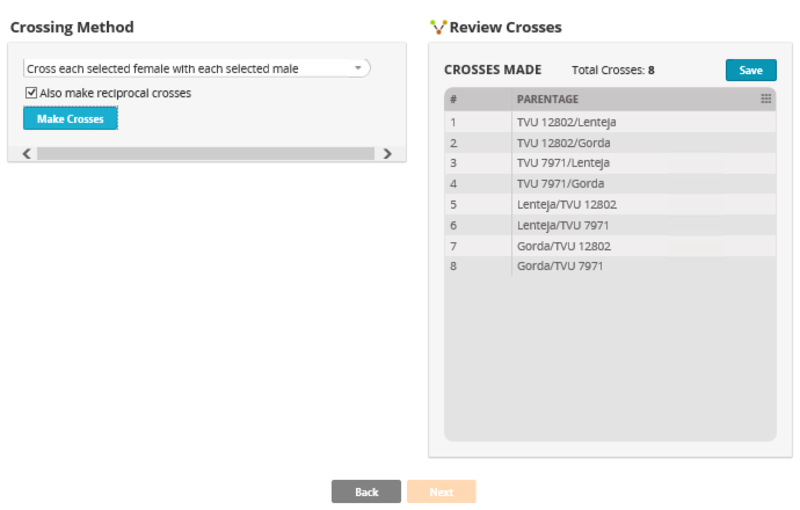 Choose a crossing method from the drop down menu and select whether or not to make reciprocal crosses. Select Make Crosses to review the crossing list. Save the crossing list and select Next. Select Export Cross List from Actions Menu to export crossing list as a spreadsheet (.xls) file. Select Done to exit this cross.